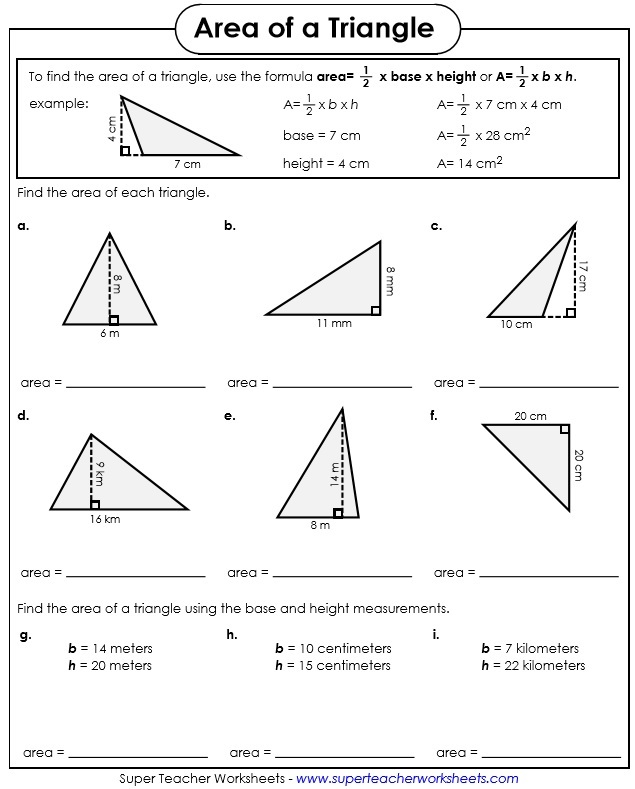 Calculate the areas of triangles on these printable worksheets. Calculate the area of each of the nine triangles shown. Use the formula to find the areas of these six right triangles. This printable will help students discover the relationship between the areas of rectangles and the areas of triangles. Answer these thinking questions about triangles and area. This worksheet shows students how to find the area of a triangle. There are 9 practice problems. Triangles measurements have two-digit numbers, decimals, and fractions. Find the area of each of the triangles shown. This page has nine triangle illustrations and three problems with written measurements. All triangles have metric measurements. Find the area of each rectangle. Divide each rectangle in half and find the area of each triangle. This worksheet shows the relationship between the areas of rectangles and triangles. Find the area and perimeter of each triangle shown. This worksheet shows students how to find the area of a triangle. There are 9 practice problems. Triangles measurements have mixed units, decimals, and/or fractions. Find the areas of the triangles. Base and height measurements include larger numbers decimals, and fractions. Some triangle measurements also have mixed units. On these worksheets, students practice finding the areas of rectangles and squares. 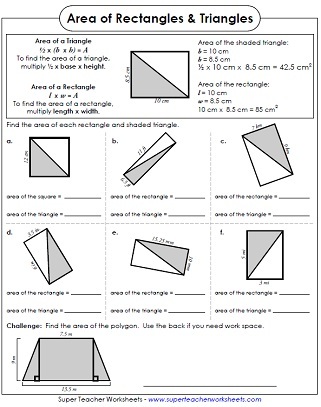 Calculate the areas of rectangles and squares with the worksheets on this page. Also includes area of triangles, trapezoids, parallelograms, as well as surface area. Browse our complete collection of geometry worksheets. Topics include perimeter, polygons, symmetry, tessellations, and more. Learn about radius, diameter, circumference, and area of circles.